INDIAN WELLS, Calif. — The network of organizations founded by the conservative industrialists Charles and David Koch is going “all in” to defend GOP majorities in Washington and around the country in 2018, planning an early investment in paid media to work against what they concede is a daunting political environment for their allies in government. Top officials from Americans for Prosperity (AFP), the Koch network's chief political arm, made a half-hour presentation Monday to more than 500 donors at their semiannual “seminar,” outlining their $400 million strategy to protect like-minded incumbents while targeting vulnerable Democrats in key Senate races. The strategy session came with a frank assessment of the midterm landscape, where President Donald Trump and the GOP brand is underwater and Democratic voters are demonstrating strong levels of enthusiasm. Key to the strategy is going on the offensive now, particularly in Senate races with television ads to try and define the narrative early against Democratic targets. “You don’t wait until the end when often it’s too late to make a difference,” Seidel said. Seidel cited the Ohio Senate race in 2016 as a template for success, where AFP invested early in paid media against Democratic candidate Ted Strickland and helped turn around an initial double-digit lead over Sen. Rob Portman to a durable lead for the Republican incumbent in the fall, which allowed them to focus their resources elsewhere. AFP President Tim Phillips cited two Democratic senators as top targets at this stage: Tammy Baldwin of Wisconsin and Bill Nelson of Florida. Baldwin has already been on the receiving end of a $20 million campaign that AFP launched to successfully advance the tax legislation that passed last year. And AFP boasts a physical presence in the state that is even larger than the membership of the state teacher’s union, a traditional force. AFP is analyzing 12 other states for potential involvement this year, with Indiana and Missouri already locked in as targets as well. Phillips cited the Monday morning announcement that Rep. Rodney Frelinghuysen, R-N.J., would not seek re-election as emblematic of the challenge in keeping the GOP’s majority in the House. As many as 80 seats could be competitive, he said, and AFP would ramp up a direct mail campaign between May and August in hopes of making a difference for their favored candidates. 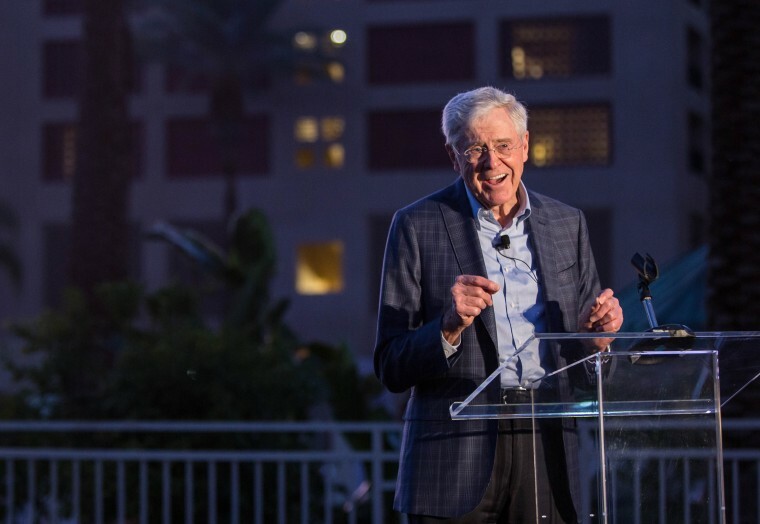 The Koch network’s political efforts are just as focused on key state races that will be critical in influencing the redrawing of state legislative and congressional boundaries after the 2020 census. AFP identified governors' races in Florida, Illinois, Michigan, Nevada and Wisconsin as initial targets — all currently have GOP incumbents; only Bruce Rauner in Illinois and Scott Walker of Wisconsin are seeking re-election. AFP considers two main criteria for determining their involvement: whether there is a “principled candidate” who backs their agenda, and whether they can make a difference in the election. AFP has affiliates in 36 of 50 states — a list that doesn’t include deeply blue states where officials say their efforts have failed to move the needle in the past. In Florida alone they have 13 field offices, 33 paid staff members and more than 200,000 volunteer activists.